Road crashes has been regarded as one of the top killer disease worldwide. Many people have perished or have been seriously injured in road crashes. As such, road safety is and should be a top concern among national and local agencies. We are all vulnerable road users whether we are pedestrians, motorists or riders regardless of our age, gender, ability or health, income and other attributes. And so it is in our best interest to be aware of and participants to initiatives advocating road safety. The Philippines is part of the Global Road Safety Partnership (GRSP) with its own PGRSP acting as an umbrella organization consolidating and coordinating road safety initiatives among government and private organisations. Among these initiatives are programs promoting road safety among our youth and particularly to our children. Kids are very receptive to ideas. Their minds are like sponges in terms of their absorption of knowledge and information about everything around them and what’s provided to them. If they are taught about road safety at an early age, they would hopefully be able to appreciate this and even influence their parents, siblings and relatives to be practitioners and advocates of road safety. Road safety promotion initiatives like this is a collaboration of several government and non-government entities like the DOTC, PGRSP and Safe Kids Philippines with support from various partners in the private sector including Automobile Association Philippines (AAP), Top Gear, and of course, Volkswagen Philippines, which has a very active child safety program. 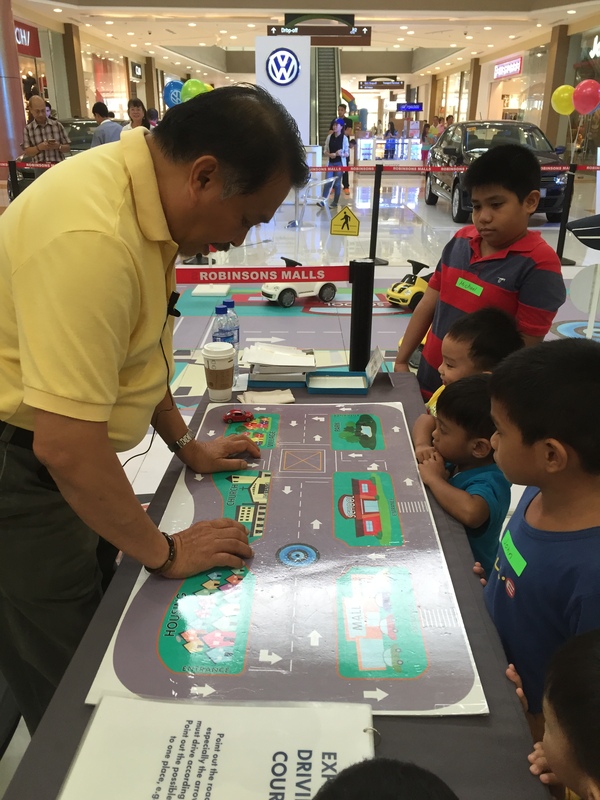 Layout of the ‘portable road safety park’ that can be easily set-up in road safety promotion roadshows like those being held at malls around Metro Manila and its adjacent towns. Another view of the ‘park’, stage and orientation area for the road safety initiative at a major mall in Antipolo City, which is to the east of Metro Manila. Children and their parents/guardians flock around a resource person for the road safety initiative and park. Kids try out the portable road safety park, simulating traffic using toy cars and familiarising themselves with basic traffic rules and road signs. People should be taught about road safety at an early age. Children are very receptive and their minds are like sponges in terms of absorbing the information provided to them (e.g., road safety practices, correct behaviour for pedestrians and motorists, etc.). We hope that there will be more initiatives like the one we featured here. I believe there are many who support road safety and those who are interested in promoting it among various stakeholders. Hopefully too, these will be extended and held in other cities around the country in order to increase road safety awareness and support that will ultimately lead to safer road environments for all. By d0ctrine in Behavior, Policy, Road Safety on July 14, 2015 .